Open Air Lifestyles, LLC's Marni All Weather Wicker chaise lounge is unsurpassed in style and comfort. Sun, salt and hours of lounging will never harm this collection. 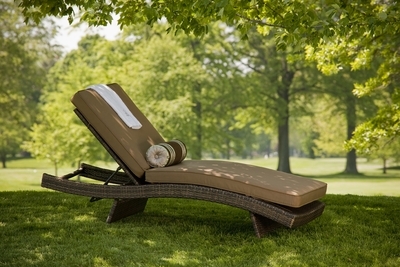 Standing alone or accompanying other furniture sets, this chaise lounge collection will bring an upscale look, no matter if it's around a pool or a patio. Marni All Weather Wicker Lounge comes in Viro Prussian Dark Bronze wicker with Sunbrella fabric Canvas Cocoa cushions.